October 26th. 10 days after we began this adventure. Normally we would be boarding a plane for home about now, but instead we're only beginning our journey. Civilization well behind us, the ship approaches the island of Steeple Jason in the very North East part of the Falklands archipelago. Fewer than 500 people visit here in a -good- year, and very few years are considered "good" in this part of the world. Tomorrow is not forecast to be "good", but today we are taking advantage of the extraordinary good weather to land here, where many of the naturalists have not yet had a chance to visit. I have a sunburn, just a few degrees above the Antarctic Convergence. Not even the locals come here and we will use this as bragging rights in the pub tomorrow. Approaching Steeple Jason we launch a zodiac to reconnoiter. It is determined that a landing here might be possible, but afternoon winds would preclude a pickup. We navigate to the North side of the island where conditions are more favorable and make a reasonably dry landing. We have come to this remote spot, not because it is remote, but because it harbors spectacular colonies of seabirds, and also some of the rarest and the most endangered. The first we encounter are the Caracaras. It is estimated that fewer than 600 of these birds are left in the entire world. Raptors, they are related to falcons, but behave like crows. The local name is "Johnny Rook". Leave anything on the ground and they will soon arrive to prod, poke, and carry it away if they can. Our companions have lost sunglasses left in an unguarded moment, and even hats off their heads as we walked! I have photographic proof! I could stay and play with them all day. However, we have a schedule. 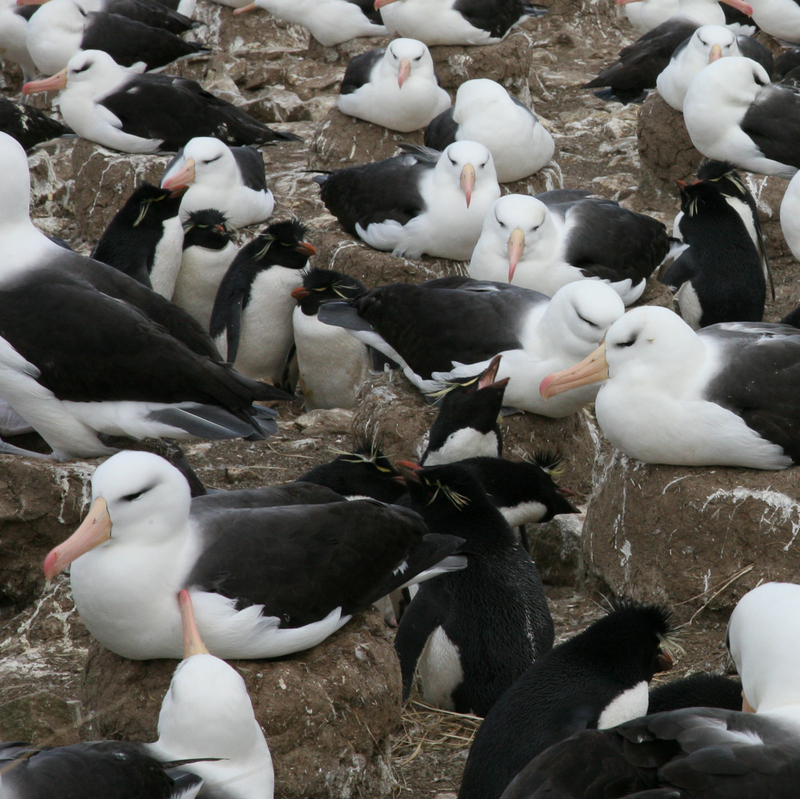 This morning our destination is one of the largest breeding colonies of Black-browed Albatross in the world. We fight our way through tussoc grass higher than our heads (imagine a corn maze on steroids) to the edge of the colony. Albatross. One hundred and fifty thousand breeding pairs. Three hundred thousand individual birds are spread out on the beach before us. Each pair sitting on a pier-like mud nest they construct or repair each year. The noise is stunning. Among the albatross are 80,000 pairs of Rockhopper penguins, sheltering their eggs beneath the huge albatross from the predatory Caracaras. It is not a congenial relationship since the Rockhopper and albatross constantly squabble, yet together they face a common threat. It is not understood what the albatross get out of the relationship (if anything). My narrative cannot do justice to the scene before us. Too soon we have to brave the rooks, and look in on the smaller colonies of nesting Gentoo penguins, for out return trip to the Explorer. Once aboard we up-anchor and steam for three hours for a landing at Carcass Island. Named after a ship that was in turn named after a type of ship, there are few actual carcasses strewn around. This stop was chosen because no introduced species (rats) threaten the local wildlife population. 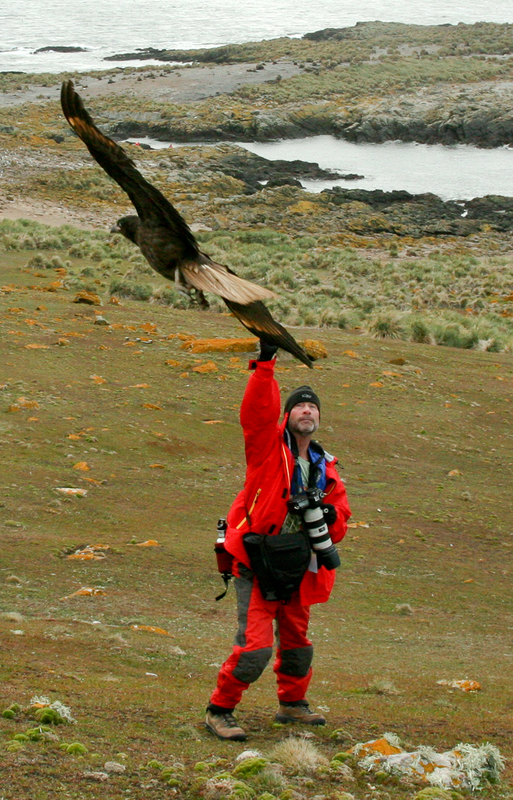 In one three hour walk, our resident bird specialist, Richard White, introduced us to 20+ new species that are endemic to the Falkland islands. The wind was cutting on the island as we prepared for the zodiac trip back to Explorer and a departure to Stanley, the capitol of the Falklands . As I type after dinner the the ship is rolling noticeably. A Force Eight Gale is forecast, so I suspect our warm welcome to the polar regions is at an end. 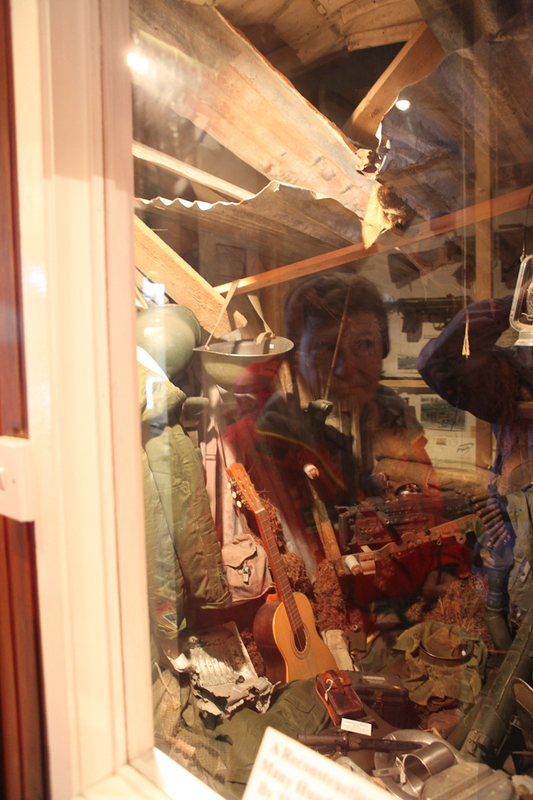 Judy here: I'd just like to go into a bit more detail about our first day in the Falklands. The two islands we visited were very different, but both incredibly rich in bird life. The first, Steeple Jason has the huge colonies, and is so inaccessible that no one has ever lived there, and the ship is hardly ever able to land zodiacs. It has a narrow neck between two higher bits, and the Gentoo penguin colony lives there. There was no place to land the zodiacs on the first side, which has an easier walk to the Albatross nesting colonies, and we had to steam around to the other side to land on the more protected side. We clambered up over a fairly steep rocky shore to disembark, but the crew and staff stationed themselves all along the way to help, and they put down rubber mats to improve the footing, so most people were able to do it. As soon as we got off, we were surrounded by the Striated Caracara (“Johnny Rooks”), who were intensely interested in us, as Rick described. They are quite huge, with enormous strong talons, like small eagles, so this was a bit intimidating, as well as astonishing and wonderful. They would hover just overhead, and swoop at us, and we were warned not to leave anything lying about as they would immediately grab it and run. We ignored the penguins for the moment and set off immediately uphill toward the albatrosses, which we could not see from the landing. We hiked up over springy turf of sorts that was a pleasure to walk on. Looking more closely, it was composed of a great variety of mosses, lichens, and low-growing leafy plants, pretty much tundra. There are no native trees in the Falklands, and on uninhabited islands like this, there are none at all. It is distinguished from tundra by the tussock grass, which is remarkable. Lower down it actually looks like grass in little tufts, but the tufts get bigger and bigger as you climb. Near the top of the ridge, we found ourselves forcing our way around tufts that were yards across and well over our heads, with narrow aisles and smaller tufts between them, that we had to squeeze through or climb over. It was great fun, although we couldn't help thinking that if we got lost, no one would ever be able to find us. I had a walking stick, and we decided we could take off one of the red parkas and wave it over our heads. 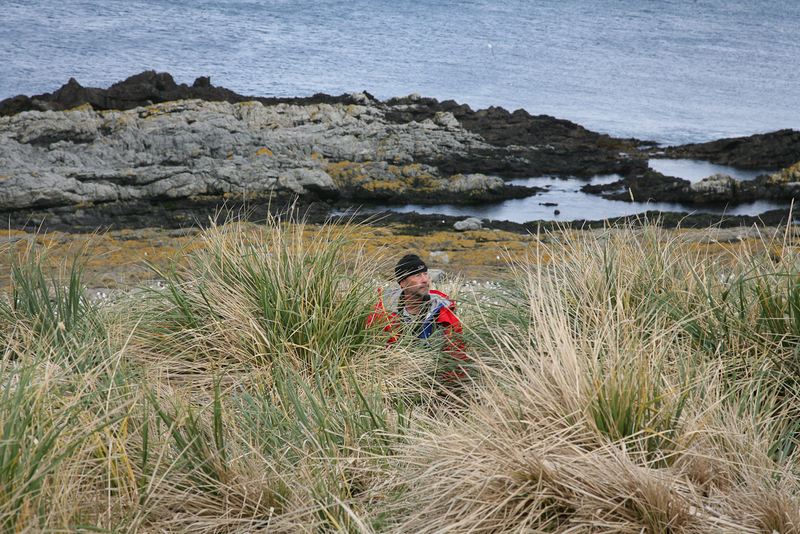 At the top of the ridge we came very suddenly to the edge of the tussock grass to overlook the breeding colony, stretching a hundred feet or more down to the rocky shore and several miles into the distance. 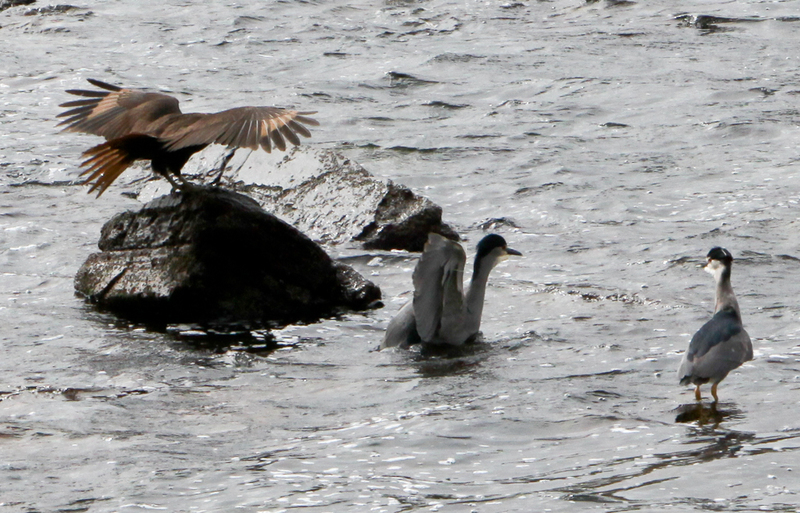 Each bird sat on its own mud mound, a couple of feet high up where we were. It was densely packed, with the Rockhopper Penguins around the bottoms of the albatross nests, and the nests only a few feet apart from one another. Even if we had not been warned not to disturb the birds, we could not have gone forward into the colony itself. We stood quietly among the tussocks, photographing madly and watching the birds interact. It is spring, there are eggs but no chicks so far; but we are told that even when they are not pair-bonding they greet each other with their ritual of ducking and bobbing and sparring with their long beaks. The second island, Carcass Island, is a great contrast in several ways. The great similarity is that there are no rats or mice or cats, so the bird populations are huge and include unique endemic species, and, on Carcass Island particularly, many small birds that have been wiped out by rats on other islands. The birds behave like those in the Galapagos, having no fear of humans, and sometimes displaying a definite interest in us. Carcass Island is inhabited. The guide book lists the population as 2-4 in summer. The single homestead includes a couple of holiday cottages in addition to the farmhouse, and small airstrip that brings in occasional visitors. The house has imported trees and other landscaping around it, making it very pleasant and inviting. The small birds seem to have taken a great liking to the trees. We chose to go on the bird walk with the extremely knowledgeable bird specialist, Richard White. After stepping off the floating pier (a dry landing), we climbed to the top of the small ridge and looked back at the bay. From that spot, we saw all three kinds of goose (Kelp Goose, Upland Goose, Ruddy-headed Goose), the flightless Steamer Duck, Black-crowned Night Herons being harrassed by Striated Caracaras (see photo), the other Crested Caracara on top of a large bush, ubiquitous Tussock Birds that would practically stand on our boots, and Magellanic Penguins standing about on the rocks and nesting in the meadows. A short walk showed us at least a dozen other species, most of which, of course, we had never seen before. Finally we returned to the farmhouse, where the island's owner provides a lovely tea with an impressive array of tea cakes and biscuits. He and his wife have owned the island for a little more than 30 years, and although they still run sheep, the bulk of their income is now from tourism. They are great friends with the Lindblad crew from the early days. Today, the weather changed and we landed at Stanley, the main city – well, the only city, actually – in a high wind under gray skies. It is not so very cold, mid-forties, and wind is not quite so high as forecast, so we have spent the day exploring the town. The entire population of the Falklands is 3 or maybe 4 thousand (the census is due next week), and only fifty or so of them live “in camp” -- that is, out in the countryside. They are a territory, like Guam, and they are ever so British, in the way that colonies are so much more so than the home team these days. The market shelves are stocked with Marmite and HobNobs, and the pubs are the center of social life. I was curious as to whether there was a Falklands accent, but opinion varied among those I asked, and every individual we spoke to seemed to have a different one. There are so few people that, although it is an entire country with a complete government apparatus, it is very much a small town and everyone is personally acquainted with everyone else. The wooden cathedral is, of course, Anglican. The inside is very beautiful, and lined with plaques commemorating beloved citizens. 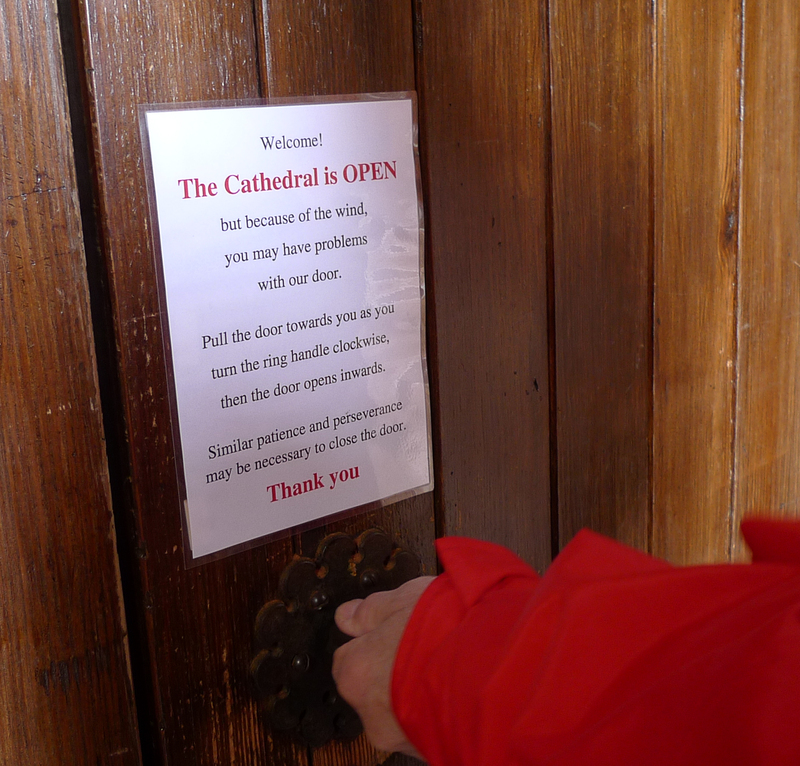 The door, here and elsewhere, is kind of a fortification against the wind, with instructions provided. At the museum we learned a lot more about the war of 1983, which was of course a big turning point recent history. We heard a couple of first-hand reports, and it is clear that the Argentine military junta simply invaded and occupied the islands in an attempt to divert attention from their own internal affairs. Several people mentioned that the young Argentine soldiers were confused and embarrassed, then frightened and dangerous, then very often dead. It was a very scary time, although it lasted only 70-some days. The losses were 75% Argentine, and only 3 civilians were killed (though out of a population of 3000...). The people are very grateful to Britain for their liberation, and gladly welcome back the veterans who come to visit, and the British soldiers who are stationed here and act as local constables. The Argentines are still harassing them, and have lately cut off their formerly flourishing trade relations with Chile by blocking any shipping through the Strait of Magellan, so they now have to get supplies from Brazil through Uruguay. We had lunch in the Falklands Brasserie, where I was told we could get Uplands Goose pate. We did, and it was very good (although indistinguishable from any other goose), served with diddle dee jam (diddle dee being a local berry, much like lingon berry) – but the rest of the menu ran to fish-and-chips and steak-and-ale pie, and similar basic English pub fare, which seems to be pretty much it for Falklands cuisine. In the afternoon we toured a hydroponic vegetable grower who supplies virtually all of the local produce, as well as supplying all the produce that we ourselves will be eating for the rest of the voyage (so they are also quite fond of Lindblad). 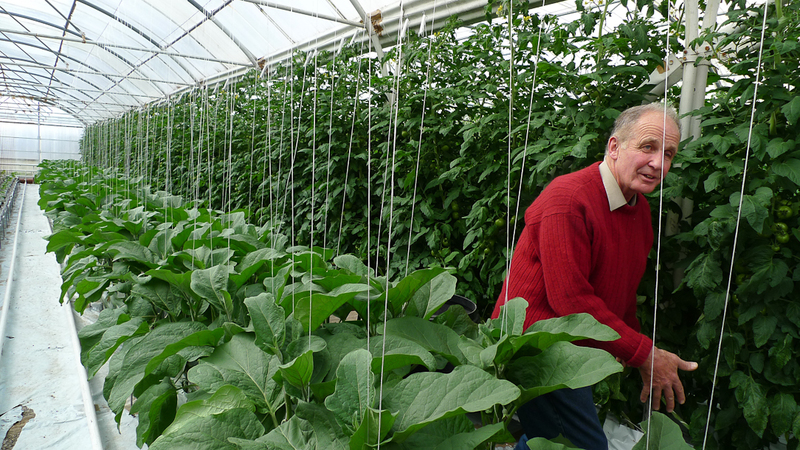 It was fascinating, they try very hard to be self-sufficient and sustainable and ecologically sound, and they do some wonderful things – but they still have to import their 100% organic chicken manure all the way from England. Still, this is a very do-it-yourself kind of place. I have to say, the Falklands are wonderful and would be well worth visiting even if they were not on the way to South Georgia. That's it for now though. From here we will spend two more days at sea before we reach our destination, South Georgia Island itself.